German Finance Minister Wolfgang Schaeuble made a statement not often heard from high-up Europeans concerning Turkey's bid to join the European Union: "We should not accept Turkey as a full member ... Turkey is not part of Europe." 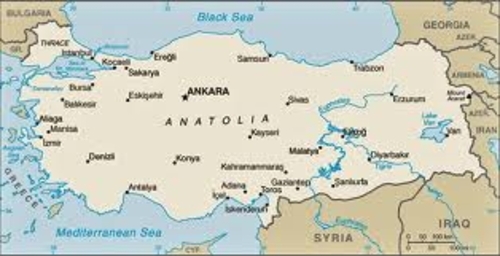 Note the miniscule part of the Republic of Turkey, at the far West, in Europe. Geographically, no. As commonly understood, Europe ends at the Bosporus and, thus defined, the Republic of Turkey clearly includes European territory. 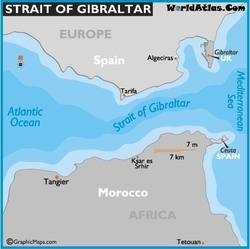 But by that standard, had history turned out a bit differently, Morocco rather than Great Britain could have held Gibraltar these past centuries; would that make Morocco part of Europe? I think not. Likewise, Eastern Thrace (Doğu Trakya in Turkish) being part of Turkey does not make Turkey part of Europe. Gibraltar could easily be Moroccan. Then what? Conversely, because Great Britain, Ireland, and Iceland are islands in the Atlantic Ocean does not prevent them from being part of Europe (despite the memorable British newspaper headline from the 1940s, "Fog in Channel: Continent cut off"). In other words, what counts is civilization, European vs Muslim, not waterways. Morocco and Turkey are both for many centuries part of Dar al-Islam, the Muslim world, Islamdom, call it what you will. Atatürk's reforms, to be sure, made Turkey appear more European and less Islamic but they did not change the essence of the country's culture, as has been increasingly evident during the past decade.